The Sega Strategy Humble Bundle is filled with offers on franchises such as Company of Heroes, Warhammer, and Total War. The bundle offers Company of Heroes Complete Edition, Warhammer 40,000: Dawn of War, Medieval II: Total War collection, Rome: Total War collection along with a Sega Strategy Pack – all for just $1. If you pay more than the current average for these games ($6.26 at the time of writing), you also unlock Valkyria Chronicles, Warhammer 40,000: Dawn of War II, Eastside Hockey Manager, Total War Shogun 2, and a coupon for 66% off on Football Manager 2016. 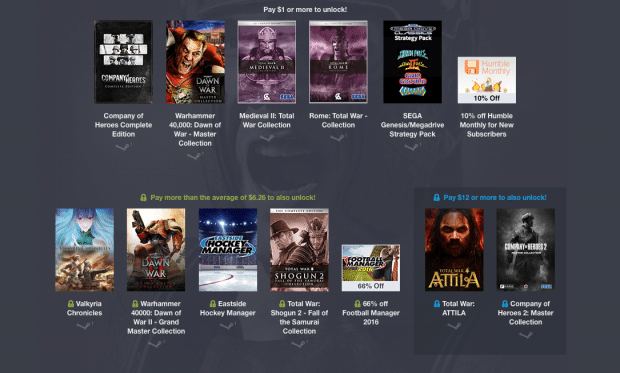 Pay 12$ or more and you get Total War: Atilla and Company of Heroes 2: Master collection as well. As always, one can decide where your money will go: Sega, a number of charities, or a tip to Humble Bundle. Get your bundles here.